Hanging out at Crescent Beach a couple times per week, 11-year-old David Farina grew bored of playing in the sand. He turned to watching people surf and bodyboard and decided he wanted to try it. Although it was frustrating at first, once he caught a real wave, David was hooked. When he wasn’t on the water, he was glued to shows like ESPN’s Surfer Magazine. On one episode they showed a 10-second clip of a guy shaping a surfboard. David’s head exploded! He says it was like a switch turned on and he became obsessed with wanting to learn how to shape boards. Little did he know that this adolescent obsession would lead him to one day establish his business, Farina Handcrafted Surfboards which not only makes surfboards and wakeboards but teaches others to shape their own boards. But we’re getting ahead of ourselves. The road to his business was not a straight path… it has been a winding journey with many turns, dips and hills to climb. Shortly after David saw the ESPN clip, a friend gave David an old longboard. David and his father proceeded to make a big mess in the garage as they stripped off fiberglass and tried reshaping the old foam. In the process, they sought (in vain) for a boardshaping teacher and finally settled on trial and error. After a couple of weeks of shaping and fiberglassing, they ended up with something that kind of resembled a surfboard. The “kind of” part pushed them to continue their quest to find instruction on boardshaping. David’s father took him to almost every factory from Cocoa Beach to Daytona and no one would even allow David into the factory unless he was planning on ordering a board. No one would share information - and of course was this before the age of the Internet and how-to videos. David’s dad did find a book on surfboard building and how to do repairs. This book (even though it wasn’t even a real “how to” book) became David’s bible. David began doing repairs and eventually discovered where to get blanks (foam for surfboard shaping.) He continued his trial and error with discards from places like The Surf Station and blanks he purchased. Although he made more boards and they even began to look better – they still weren’t surfboards. Fate played its hand again when one of David’s friends became obsessed with the same passion for board building – and his parents had a building they let them use to set up a real factory. David and his friend built boards under the “Alternative Surfboards” label which were sold in Gainesville and Crescent Beach. Fast forward to post college graduation. David’s mentor Mike (yes, the same one who taught him to shape his first real board) gave David a job at his factory. However, the call of opening his own business here in St. Augustine was too much too ignore. In 1994, David and his good friend, Chuck Phillips, opened Zion Surf Company in St. Augustine. At its peak, Zion was producing 20 boards per week and shipping them all over Florida, Central America and the Caribbean. Nine years later, the Chinese “pop out” imports hit the surfboard market hard. Retailers dumped businesses like David’s in favor of cheaper alternatives. The market became flooded and Zion was forced to shut down. David went back to his day job as a cardiovascular technologist but unexpected life changes in 2013 brought him out of “shaping retirement.” David reestablished old contacts and built new relationships within the industry. And so, Farina Handcrafted Surfboards was born. The teaching component of his business evolved naturally. A friend asked David whether he’d help his son shape a board and they did a step-by-step shaping lesson. Of course, David’s 10-year-old had to get in on the action reminding David of shaping with his father – only this time they could actually make a real board! Word spread and soon other young men came to do step-by-step shaping lessons with David. Parents have been really pleased and the kids have a blast. The feedback and demand has led David to pursue the build-your-own board aspect of the business. David currently is building a new teaching room in the industrial center by Flagler Hospital. Seeing how proud people are of their creations and the fact that the boards look great and work well in the water has been more rewarding than David could have imagined. This side of the business is the one David is eager to pursue and grow – more so than building his own label again. Teaching shaping is a skill that only a handful of companies worldwide do. 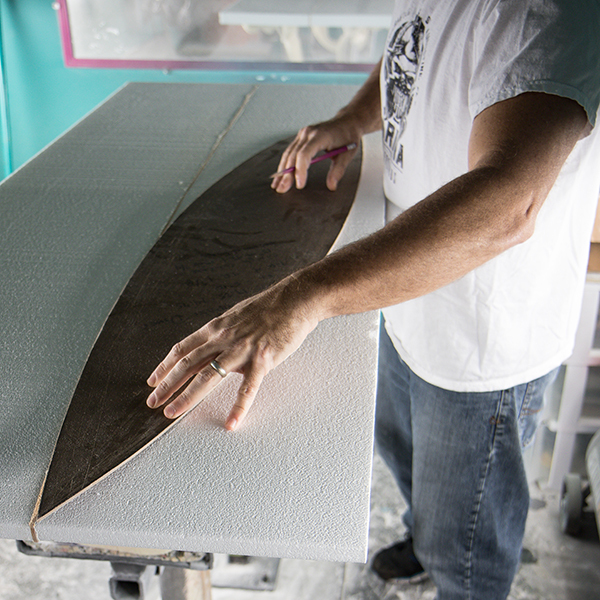 Shaping has a rhythm with a step-by-step process in order to correctly produce a board. Even with all the information available today from YouTube videos and “how to” books, David explains that nothing is better than hands-on learning. Farina Handcrafted Surfboards will provide participants hands-on instruction during David’s workshop at Made in St. Augustine. Be sure to also stop by his booth featuring his handcrafted boards and wakeboards.